Round dolly simplifies moving around empty or full trash receptacles (sold separately). Simply set your empty receptacle on the dolly and lock it into place with a quick quarter turn. 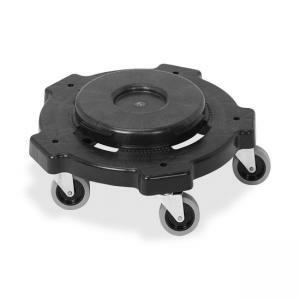 Full or empty, the receptacle rolls easily where you need it on the five nonmarking 3" gray casters. Dolly is designed to fit round Genuine Joe trash receptacles that hold 32 or 44 gallons. Dolly is made of heavy-duty engineered resins. $160Deflect-o Platform Hand Truck - 21" x 32.75"
$177Deflect-o Platform Hand Truck - 21" x 32.75"